Using this information, you can gather a handful of insights about your serverless application with minimal effort. 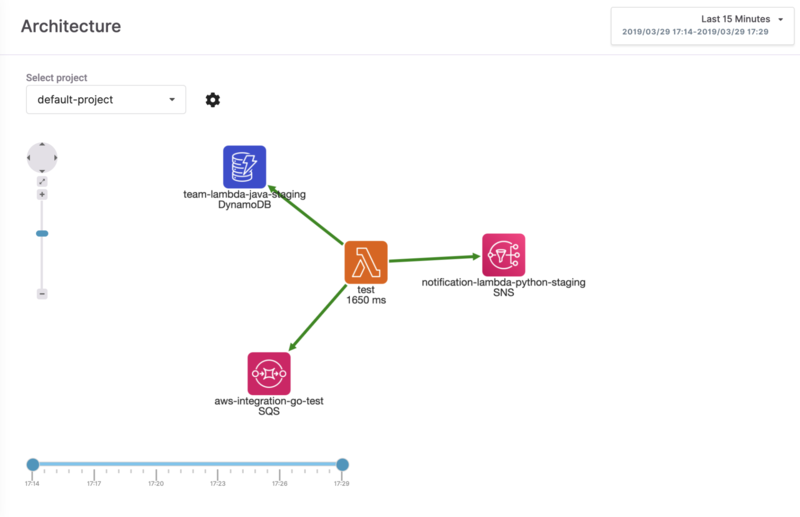 For example; you can measure the requests to the DynamoDB table and detect the bottlenecks occurring because of AWS resources. 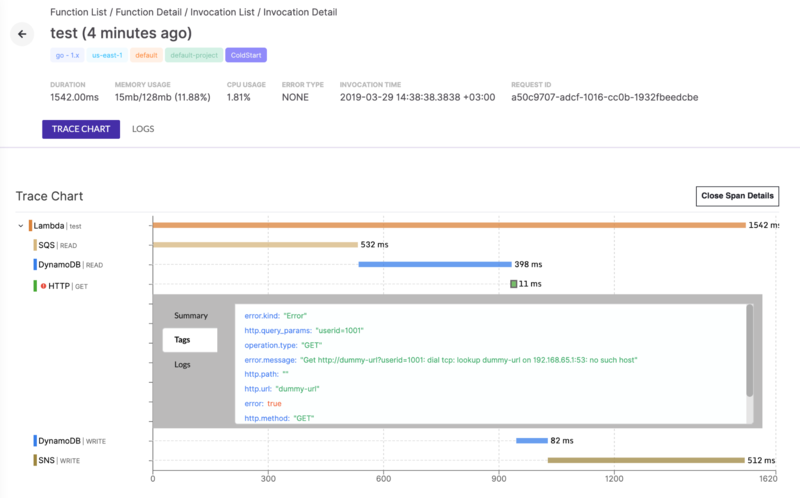 In addition to the AWS SDK Integration, now you can also trace your HTTP calls using the new HTTP integration of our Go agent. Just like the AWS SDK integration we have mentioned above, it requires almost no code change(again just 1 additional line). This time you have to wrap http.Client with the thundrahttp.Wrap and then use the wrapped client to make your HTTP clients. Thundra’s Go agent will create the corresponding spans for your HTTP calls and adds some useful information about your requests like the host, the path and the query parameters. Let’s see a demo lambda function that shows what these new integrations provide us. In this lambda function, we will first get some messages from SQS. Then, we will extract the `userId` attribute from these messages. We will look for the user with `userId` in DynamoDB and in another external server by making an HTTP call. If we will not be able to find the user, then we will create a new user in DynamoDB and publish an SNS message. 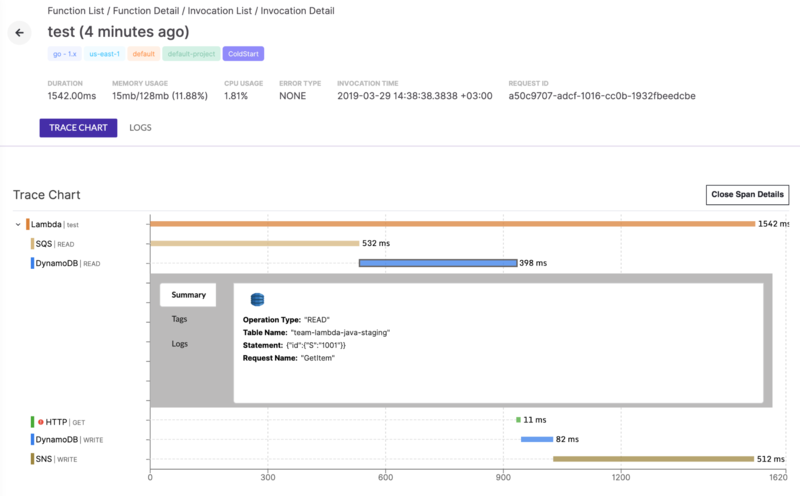 As you can see in the trace chart even though we didn’t explicitly create any span, we have spans representing our AWS SDK calls and the HTTP call! That’s because integrations created spans automatically for us. Let’s see what else integrations provided us by clicking the spans. When we clicked the first DynamoDB span, we see that in the Summary tab we have some useful information like Operation Type, Table Name, Request Name, and the Statement. If you don’t want your statements to be collected you can also disable it by setting “thundra_agent_lambda_trace_integrations_aws_dynamodb_statement_mask” environment variable to true. developers see the problematic interactions in the application at a glance. When you see an error which is not green, you can see that there are some errors happening between a Lambda function and the resource. Clicking on an edge enables to see the problems in the architecture. Detailed information about our architecture view can be seen in our blog. 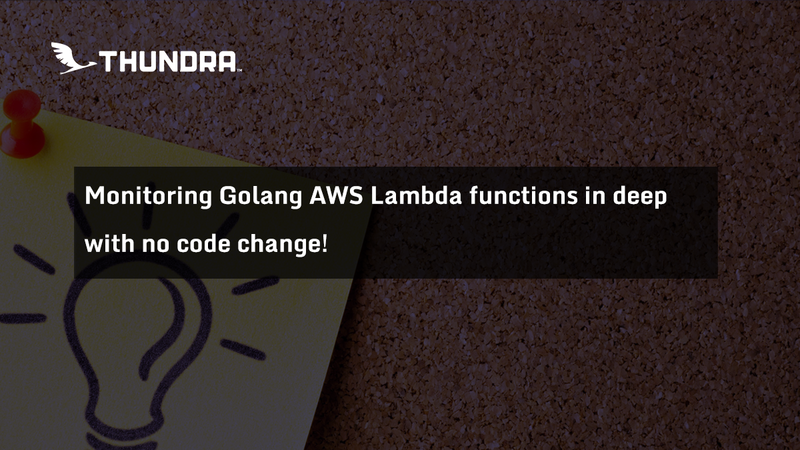 We have seen how much useful information Thundra’s Go agent can provide us about our lambda function by just adding 2 lines, with the help of the new HTTP and AWS SDK integrations. It's great to have automatically created spans and the bird’s eye view of our architecture for free, without using the OpenTracing interface to explicitly create spans. Also, this was only a start for the Thundra’s Go agent’s integrations, and it will continue with the integrations like Redis, MySQL, Elasticsearch, MongoDB and many more. You can sign up to our web console and start experimenting with Thundra. Don’t forget to explore our demo environment — no sign up needed. We are very curious about your comments and feedback. Join our Slack channel or send a tweet or contact us from our website!